The Thirteenth Judicial District Commission on Judicial Performance unanimously recommends that Judge Kevin L. Hoyer BE RETAINED. Judge Hoyer earned a Bachelor of Arts in History from the University of Colorado in 1977 and a Juris Doctor degree from the University of Colorado School of Law in 1980. 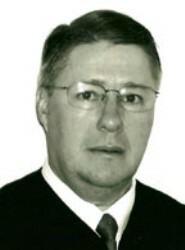 Before being appointed to the District Court bench in 2005, Judge Hoyer was an attorney in private practice for twenty-five years and served part-time as the County Court Judge for Washington County for eighteen years. Since 2010 Judge Hoyer has worked with other local agencies to develop and implement the Morgan County Adult Drug Court and currently serves on the Drug Court Steering Committee. Judge Hoyer is an active member of the Akron Lions Club and is active in his church. Judge Hoyer’s performance was rated overall average by attorneys in the areas of fairness, communications, diligence, and application of law. In the area of overall demeanor he was rated above average by attorneys. Judge Hoyer’s performance was rated overall slightly below average, but still within the acceptable range, in all areas by non-attorneys.